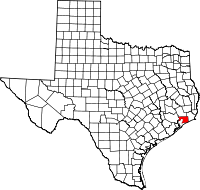 Chambers County is a county in the U.S. state of Texas. As of the 2010 census, the population was 35,096. The county seat is Anahuac. Chambers County is one of the nine counties that comprise Greater Houston, the metropolitan statistical area (MSA) of Houston–The Woodlands–Sugar Land. Mission Nuestra Señora de la Luz, a Spanish mission in Texas, was established in 1756 near what is now Wallisville. Chambers County was founded in 1858. It is named for Thomas Jefferson Chambers, a major general in the Texas Revolution. In 2019 Atlas Air Flight 3591, a cargo flight operating for Amazon Air, crashed in the Trinity Bay, in Chambers County and near Anahuac, while flying from Miami to Houston. According to the U.S. Census Bureau, the county has a total area of 871 square miles (2,260 km2), of which 597 square miles (1,550 km2) are land and 274 square miles (710 km2) (31%) are water. The south and southwestern parts of the county lie in the Galveston Bay Area on the shores of Trinity Bay and East Bay. A small portion of the southeastern area lies on the coast of the Gulf of Mexico. As of the census of 2000, there were 26,031 people, 9,139 households, and 7,219 families residing in the county. The population density was 43 people per square mile (17/km2). There were 10,336 housing units at an average density of 17 per square mile (7/km2). The racial makeup of the county was 81.88% White, 9.77% Black or African American, 0.48% Native American, 0.67% Asian, 6.02% from other races, and 1.18% from two or more races. 10.79% of the population were Hispanic or Latino of any race. There were 9,139 households out of which 40.60% had children under the age of 18 living with them, 65.70% were married couples living together, 9.00% had a female householder with no husband present, and 21.00% were non-families. 17.80% of all households were made up of individuals and 6.70% had someone living alone who was 65 years of age or older. The average household size was 2.82 and the average family size was 3.20. In the county, the population was spread out with 28.90% under the age of 18, 8.20% from 18 to 24, 29.90% from 25 to 44, 24.00% from 45 to 64, and 9.00% who were 65 years of age or older. The median age was 35 years. For every 100 females, there were 100.60 males. For every 100 females age 18 and over, there were 99.80 males. The median income for a household in the county was $47,964, and the median income for a family was $52,986. Males had a median income of $43,351 versus $25,478 for females. The per capita income for the county was $19,863. About 8.30% of families and 11.00% of the population were below the poverty line, including 13.30% of those under age 18 and 12.60% of those age 65 or over. District 4: Brandon Creighton (R)- first elected in 2014. District 23: Mayes Middleton (R)- first elected in 2018. See List of Highways in Chambers County for more roadways in Chambers County. In addition, RWJ Airpark, a privately owned airport for public use, is located in Beach City. The Houston Airport System stated that Chambers County is within the primary service area of George Bush Intercontinental Airport, an international airport in Houston in Harris County. ^ "U.S. Census Bureau QuickFacts: Chambers County, Texas". ^ Alvarez, Elizabeth Cruce (Nov 8, 2011). Texas Almanac 2012–2013. Texas A&M University Press. pp. Contents. ISBN 9780876112571. Retrieved 17 November 2013. ^ "Human remains found after Atlas Air cargo plane crashes in Chambers Co". KTRK-TV. 2019-02-23. Retrieved 2019-02-28. Wikimedia Commons has media related to Chambers County, Texas. Chambers County, TXGenWeb Focuses on genealogical research in Chambers County.